While the rollout of Australia's national broadband service has admittedly not been a smooth ride, things do seem to have been improving over the course of 2018. According to the Australian Competition and Consumer Commission's (ACCC) second Measuring Broadband Australia report, only 7.4% of NBN customers are receiving less than half the maximum internet speed promised in their chosen plan. While that percentage is still a significant number, the ACCC report finds that it could be due to "physical limitations" — like the use of old routers that don’t support high speeds — rather than shortcomings in the amount of available bandwidth or other larger infrastructure issues. On the other hand, around two thirds of users are seeing speeds that are at least 90% of what their plan promises. In this second report, the ACCC expanded its NBN speed investigation to include six major service providers, adding Aussie Broadband and MyRepublic to the usual suspects of Telstra, Optus, TPG and iiNet. 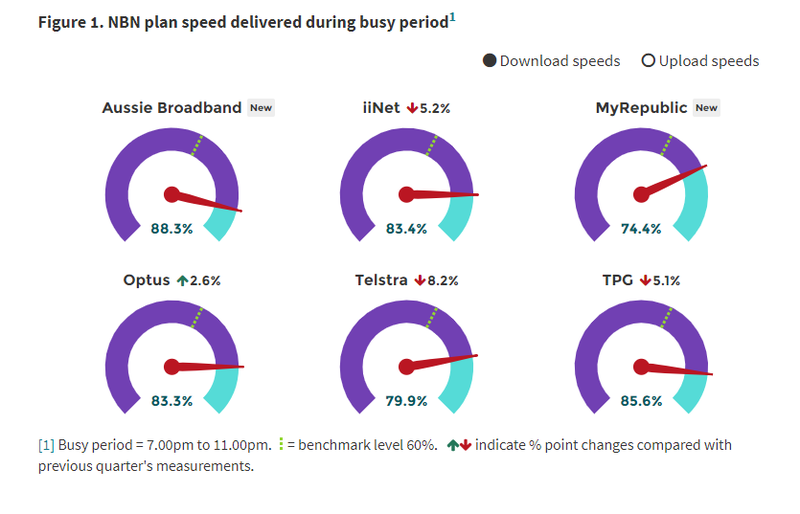 Of the six, Aussie Broadband came out on top in terms of overall performance, consistently delivering 89.1% of maximum plan speeds to customers during the day, with only a 1% drop during the peak hours between 7pm and 11pm. TPG ranked second, delivering speeds of at least 85.6% of the maximum promised in a chosen plan. On the other hand, MyRepublic was the worst performer, delivering just 79.5% of maximum plan speeds during the day, with speeds dropping around 6% during peak times. Telstra clocked in at just 79.9%, despite charging its customers a premium for using its "superior network capabilities". In a bid to hold internet service providers accountable for providing promised speeds to their customers, the ACCC began to measure the real-world speeds of around 800 NBN and ADSL fixed-line services across the country, releasing its first Measuring Broadband Australia report in March. There hasn’t been much improvement in speed delivery performance by the telcos between then and now, but ACCC chair Rod Sims says he is "encouraged" by the results, especially given the peak time performance doesn’t drop "significantly". "Whilst we are pleased to see that most customers are able to get fast, reliable broadband services even during busy hours, we must focus our attention on those who do not have this experience," he said. While the Communications Alliance, the organisation that represents service providers, is happy that the ACCC report confirms the peak-hour speeds "are being well managed", it’s not pleased by the fact the report only takes into account maximum speeds and not advertised speeds which, the organisation says, the telcos are actually delivering. "The service providers achieved an average of 99.9% of their advertised speeds, excluding the one provider that does not advertise typical busy hour speeds," said Communications Alliance chief John Stanton. However, he felt it was unfortunate that "given that the ACCC has issued guidance – and providers have entered enforceable undertakings in accordance with it – that providers should not make claims around maximum plan speeds, and instead should advertise based on information about 'typical busy hour speeds'".